As performance advances achievable through chip fabrication technology are reaching their limits, other areas of system design need to be explored. Several different possibilities exist. Our research in the context of the DARPA HPCS project PERCS aims at an infrastructure to characterize and understand the interactions between hardware and software and to affect optimizations based on those characterizations. To achieve this, we have designed and implemented a performance and environment monitoring (PEM) infrastructure that vertically integrates performance events from various layers in the execution stack. 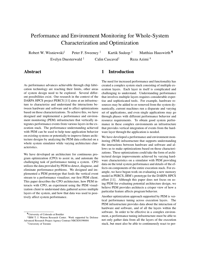 The performance understanding achieved with PEM can be used to help tune application behavior on existing systems or potentially to improve future architecture designs by analyzing the PEM data collected on a whole system simulator while varying architecture characteristics.